These days we would first make a drawing and then write some text around the drawing, so you would expect that happend in the VMS as well. Could the writer of the VMS made the text first and after that the drawings? Yes, it could be possible that the text was written first! You can see that the text flows naturally from left to right. Sometimes in small columns on the left, and or right. If you draw a line beneath the lines, you can see that on the of the plant the lines are straight, and on the right they are not in sync with that original line. If the text was made first, then the two little word inside the plant are very badly placed. 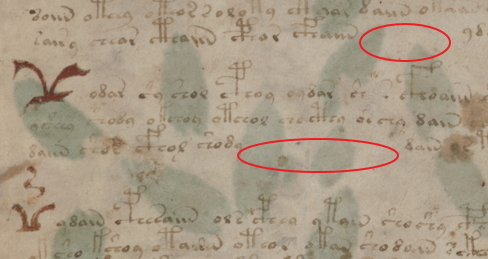 This not always the case, for example when there are a lot of labels and little drawings in between such as here on f88r (roots) you can see that the text follows a wave pattern. Clearly the text was written according to the room left by the image, so text here was made later. Look at the ‘o’ on the third word is much bigger than the first ‘o’ because there is more space for the word there. Also, the text in the cosmo pages can only be made after the circles have been drwan of course. There are also lot’s of “text-only” pages, such as quire 20 where is no room at all for a drawing except in the margin. There the author placed some nice star emoticons. Spaces such as here on f1r: what are they for? 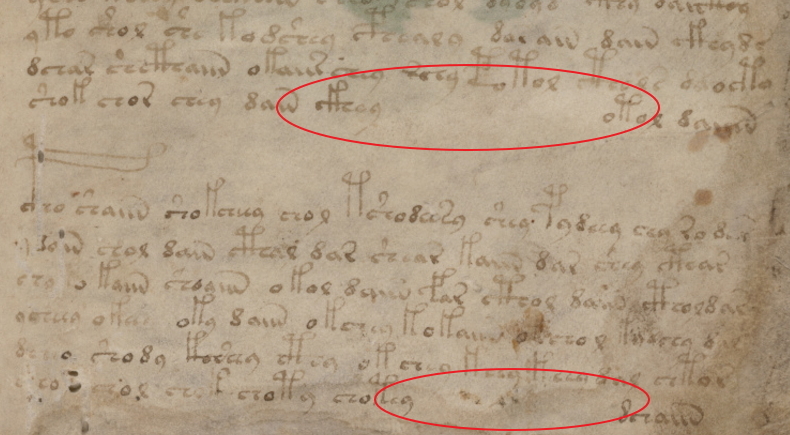 Well, in 1465 (one of the first printed text) there is this example (http://ms.webpoint.nl/img/spacesint/spaced%20text.jpg) where the blank space is meant to be filled in by Greec letters later on. For example because of the difficult printing process or because the reader was supposed to fill in those blanks himself. 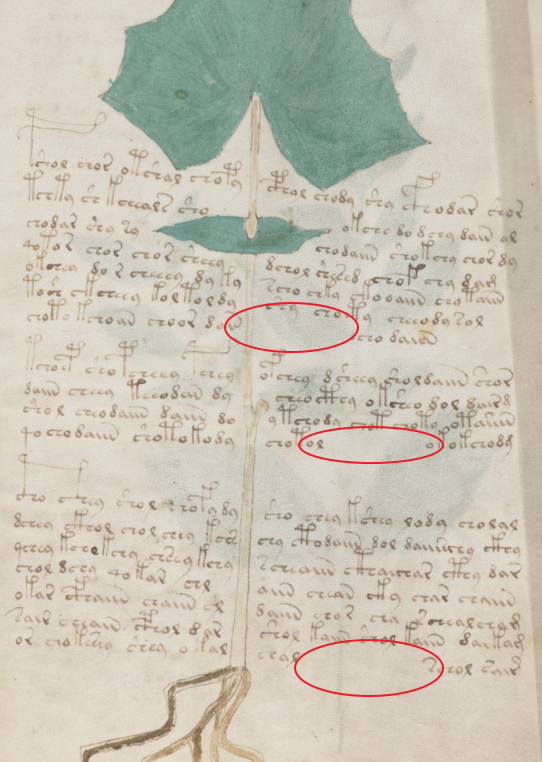 But on that particular page f1v we see two picto’s in the margin. It’is my guess that the other blank spaces were intended to be used in a similar way for similar picto’s. On this page f8r there is something else going on. Remember that we assume that the text was made first, and then the drawing was placed. If you now look at the odd blank spaces, it seems obvious that the room there was intended to hold a leave. However, the leafs on this plant are around the stem, and can not go just one direction. The artist did not see a way to fill in those gaps with such leaves and that is why that space remained unused.